Drew in the shop at Bourgeois Guitars. T. Drew Heinonen is currently operating as a solo builder. He recently completed two years working in the shop of Jim Olson in Circle Pines, MN. In 2011, Drew met Jim at a Jig, Fixture & Tooling seminar held at the North House Folk School in Grand Marais, MN. The two sparked a friendship, and several months later Jim invited Drew to work in his shop through his next build cycle. Drew spent two model years, 2012 and 2013, working with him on all aspects of the build process- from layout through to the final set up of strings. During those two seasons, they produced over 80 guitars. Previous to his time at Olson Guitars, Drew spent nearly four and a half years working in the shop of Dana Bourgeois in Lewiston, ME. 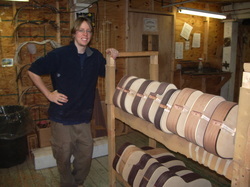 At Bourgeois Guitars, Drew worked as a Binding & Body specialist where he was involved in the binding process, neck construction, setting necks to the bodies, jig and fixture development, surface preparation, as well as the final voicing of the guitar bodies before they entered the finish department. He had a hand in the construction of approximately 1500 instruments that came out of Bourgeois Guitars before his return to Minnesota. T. Drew Heinonen's journey as a guitar builder began as a senior in college with a course entitled "The Physics of Sound," a lab based study including a wide range of acoustic properities- sound wave propagation, harmonic and overtone relationships and structure, vibrational patterns of plates, strings, and air, instrument and vocal functionality- and culminating in a final project analyzing the resonant frequencies and responsiveness of his own guitar. After completing a Bachelor's degree in Religion & Philosophy, he enrolled in the Guitar Repair & Building program at Southeast Tech in Red Wing, MN. While a student in Red Wing, Drew met Dana Bourgeois at a voicing seminar and upon graduation was invited to work in the Bourgeois shop in Maine. Currently, Drew is accepting custom orders with an approximate wait of 12 months (subject to change). Please contact Drew directly to reserve your position on his build list today. "I approach every instrument as an individual. Within a single tree, every piece of wood cut is slightly unique in its density, rigidity, visual qualities, how it reacts to being worked, and ultimately in terms of a guitar- it's tonality. These differences are expounded when comparing across a particular species, and even more so when comparing from one species of wood to the next. Some of these variations lend themselves to certain playing styles and body shapes more than others. In a similar way, every player is unique in their playing style and personal preferences. I view it as the job of the builder to maximize the inherent qualities of the wood through design and implementation, while meeting the individual player's stylistic needs and aesthetic preferences. By matching wood selection, body design, and bracing pattern, the builder can craft an instrument which will both complement and inspire the player. Throughout the course of my development as a builder, I have constantly been learning and evolving; expanding my knowledge of tone woods, design styles, and construction techniques. I have been incredibly blessed to study and practice under great teachers- to glean some insight from their experience and expertise, as well as to hone my own skills and craftsmanship to elevated levels. Even though my own serial numbers are still in the double digits, I have had the opportunity of playing an integral role in the creation of somewhere in the vicinity of 1600 guitars- approaching each one as an opportunity to further develop and cultivate my own build style and skill set. I carry that knowledge and mindset forward into each new build project, applying what I have learned along the way while not being afraid of innovation and improvement."